An admiral of the fleet or fleet admiral (sometimes also known as admiral of the navy or grand admiral) is a military naval officer of the highest rank. In many nations the rank is reserved for wartime or ceremonial appointments. It is usually a rank above admiral (which is now usually the highest rank in peacetime for officers in active service), and is often held by the most senior admiral of an entire naval service. It ranks above vice admiral, rear admiral and usually full admiral, and is usually given to a senior admiral commanding multiple fleets as opposed to just one fleet. It is often classified in NATO nations as a five-star rank. Admiral of the fleet is equivalent to an army field marshal. It is also equivalent to a marshal of the air force which in many countries has a similar rank insignia to admiral of the fleet. The title admiral of the fleet can trace its origins to the Middle Ages, where the title was typically granted to a nobleman who was appointed by a monarch to raise and command a navy for a specific campaign. Ambiguity exists when translating the French amiral into English (into admiral of the fleet or admiral). A French title of amiral de la flotte, outranking a full admiral was invented in 1939 for Darlan, who was the only person in French history to hold that title. Before the fall of the monarchy in 1952, the Egyptian Navy had the equivalent rank of sayed elbehar elazam. In the Turkish Navy, the corresponding rank büyük amiral, literally meaning "grand admiral", can only be bestowed by the National Assembly, and only given to an admiral who leads the navy successfully in and out of a war, criteria tougher than those for equivalent ranks. No one has ever been bestowed this rank yet in the republican era. During the period of the Ottoman Empire, commanders of the navy carried the rank of kapudan-i derya as equivalent. In Poland, the rank is the second highest and is a 3--star rank. The stars are not used; however, except in the very admiral's flag. The rank insignia for an admiral often involves four stars or similar devices and/or 3 stripes over a broad stripe, but as one can see below, there are many cases where the insignia do not involve four stars or similar devices. The rank also exists or has existed (on paper at least) in Bangladesh, Indonesia, Nigeria, Oman and Pakistan, although not all of these countries have actually bestowed the rank on an individual. ^ In some navies, however, such as the German Kriegsmarine during World War II, "admiral of the navy" has been considered a higher rank than "admiral of the fleet" or its equivalent. Francis E. McMurtrie and Raymond V.B. Blackman (editors), Jane's Fighting Ships 1949-50. New York: The McGraw-Hill Book Company, Inc., 1949. The Admiral of the Red was a senior rank of the Royal Navy of the United Kingdom, immediately outranked by the rank Admiral of the Fleet (see order of precedence below). Royal Navy officers currently holding the ranks of commodore, rear admiral, vice admiral and admiral of the fleet are sometimes considered generically to be admirals. The rank did not exist prior to 1805 and until 1864 this rank was the second highest rank in order of precedence. In 1864 it was abolished as a promotional rank (pictured opposite is the command flag for an Admiral of the Red). Admiral of the fleet (AF) is the highest rank in the Royal Australian Navy (RAN), but is a ceremonial, not active or operational, rank. It equates to the rank code O-11. Equivalent ranks in the other services are field marshal and marshal of the Royal Australian Air Force. Like those ranks, admiral of the fleet is a five-star rank. The subordinate naval rank, and highest active rank in the RAN, is admiral. This rank is only held when the Chief of the Defence Force is a naval officer. The highest permanent rank in the RAN is vice admiral, held by the Chief of Navy. This article is about the OF9-rank admiral of the fleet (Russia), not to be confused with the OF10-rank admiral of the fleet of the Soviet Union. For the equivalent OF9-rank in anglophone naval forces see admiral of the fleet; in the former Sovier Union see admiral of the fleet (USSR).Admiral of the fleet or fleet admiral (Russian: aдмирал флoта, admiral flota) is the highest naval (deck) rank of the Russian Federation. It is the equivalent of the Soviet naval rank of admiral of the fleet and the present Russian rank of general of the army. The rank is roughly equivalent to 4-star admiral ranks of other nations. Marshal of the Russian Federation is the only superior rank in the Russian armed forces. This article is about the OF9-rank admiral of the fleet (USSR), not to be mixed up to the OF10-rank admiral of the fleet of the Soviet Union. For the equivalent OF9-rank in Anglophone naval forces see admiral of the fleet, and in Russia see admiral of the fleet (Russia). The rank of admiral of the fleet (or "fleet admiral"; Russian: aдмирал флота, admiral flota) was the highest naval rank of the Soviet Union from 1940 to 1955 and second-highest from 1962. The rank has a rather confusing history. It was first created by a Decree of the Presidium of the Supreme Soviet in 1940 as an equivalent to general of the army, but was not used until 1944, when Ivan Isakov and Nikolai Kuznetsov were promoted to the rank. The 1944 insignia featured four Nakhimov stars, but when the rank was declared equivalent to the marshal of the Soviet Union in 1945, they were replaced with a single, bigger star to look similar to marshal's shoulder boards. The two existing admirals of the fleet were given this new 'big' marshal's star. So from 1945 to 1962, there was no intermediate rank equivalent to general of the army in between admiral and admiral of the fleet. The rank was abolished in March 1955 with the creation of the rank of admiral of the fleet of the Soviet Union but restored in 1962 as the second-highest navy rank. Holders of the ranks were given a smaller marshal's star since then. As of February 2013 the smaller marshal's star has been instituted on fleet admiral shoulder boards - equivalent of general of the army. As of February 2013 there are no active duty Russian Navy officers holding that rank. An admiral of the fleet of the Soviet Union (Russian: адмирал флота Cоветского Cоюза, translit. admiral flota Sovietskogo Soyuza), was the highest naval rank of the Soviet Union. It was comparable to NATO five-star rank (OF-10 level). Baron Fisher, of Kilverstone in the County of Norfolk, is a title in the Peerage of the United Kingdom. It was created in 1909 for the noted naval reformer Admiral of the Fleet Sir John Fisher.His son Cecil Fisher, the second Baron, was the adoptive heir of Josiah Vavasseur (1834-1908), an arms manufacturer. Vavasseur left part of his enormous estate to Fisher on the condition that he adopted the Vavasseur name. Fisher assumed the additional surname of Vavasseur in 1909 by Royal licence. As of 2017 the title is held by the latter's grandson, the fourth Baron, who succeeded in 2012. The family seat is Kilverstone Hall, near Kilverstone, Norfolk. Rank comparison chart of navies of Asian states. Note: Since none of the countries on this list are part of NATO, the conversion to equivalent NATO ranks are approximate. Rank comparison chart of naval forces of Commonwealth of Nations states. Most of the 52 commonwealth nations have their beginnings in British Empire and have shared naval traditions. By comparison Mozambique is a former Portuguese colony. Even after some had achieved a degree of independent government from the UK, their naval protection was still British; the Royal New Zealand Navy did not exist separately until 1941. Not all armed forces have such a rank, and in those that do the actual insignia of the "five-star ranks" may not contain five stars. For example: the insignia for the French OF-10 rank maréchal de France contains 7 stars; the insignia for the Portuguese marechal contains four gold stars; and many of the insignia of the ranks in the Commonwealth of Nations contain no stars at all. Typically, five-star officers hold the rank of general of the army, admiral of the fleet, field marshal, marshal or general of the air force, and several other similarly named ranks. Five-star ranks are extremely senior—usually the highest ranks. As an active rank, the position exists only in a minority of countries and is usually held by only a very few officers during wartime. In times of peace, it is usually held only as an honorary rank. Traditionally, five-star ranks are granted to distinguished military commanders for notable wartime victories and/or in recognition of a record of achievement during the officer's career, whether in peace or in war. Alternatively, a five-star rank (or even higher ranks) may be assumed by heads of state in their capacities as commanders-in-chief of their nation's armed forces. Despite the rarity and seniority of five-star officers, even more-senior ranks have been adopted in the United States, namely, admiral of the navy and general of the armies. Other names for highly senior ranks from the twentieth century include généralissime (France), generalisimo (Spain) and generalissimus (USSR). Marshal-admiral (元帥海軍大将, gensui-kaigun-taishō) was the highest rank in the prewar Imperial Japanese Navy. The term gensui was used for both the navy and the Imperial Japanese Army, and was a largely honorific title awarded for extremely meritorious service to the Emperor. In the Meiji period, the title was awarded to five generals and three admirals. In the Taishō period it was awarded to six generals and six admirals, and in the Shōwa period it was awarded to six generals and four admirals. 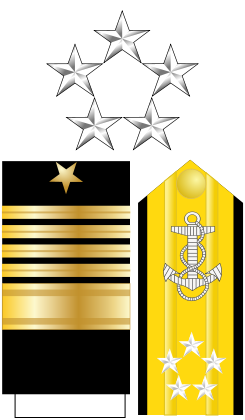 Equivalent to a five-star rank (OF-10), it is similar to Admiral of the Fleet in the UK Royal Navy and fleet admiral in the United States Navy. Note that several were promoted the same year they died; these were posthumous promotions. Admiral of the Fleet John Rushworth Jellicoe, 1st Earl Jellicoe, (5 December 1859 – 20 November 1935) was a Royal Navy officer. He fought in the Anglo-Egyptian War and the Boxer Rebellion and commanded the Grand Fleet at the Battle of Jutland in May 1916 during the First World War. His handling of the fleet at that battle was controversial. Jellicoe made no serious mistakes and the German High Seas Fleet retreated to port, at a time when defeat would have been catastrophic for Britain, but the public was disappointed that the Royal Navy had not won a more dramatic victory. Jellicoe later served as First Sea Lord, overseeing the expansion of the Naval Staff at the Admiralty and the introduction of convoys, but was relieved at the end of 1917. He also served as the Governor-General of New Zealand in the early 1920s. Admiral of the Fleet Lord John Hay, (23 August 1827 – 4 May 1916) was a Royal Navy officer and politician. After seeing action in 1842 during the First Opium War, he went ashore with the Naval Brigade and took part in the defence of Eupatoria in November 1854 and the Siege of Sevastopol in Spring 1855 during the Crimean War. He also took part in the Battle of Taku Forts in August 1860 during the Second Opium War. As a politician, he became Member of Parliament for Wick and later for Ripon. He was sent to the Mediterranean in July 1878 to take control of Cyprus and to occupy it in accordance with decisions reached at the Congress of Berlin. In a highly political appointment, he was made First Naval Lord in March 1886 when the Marquis of Ripon became First Lord of the Admiralty but had to stand down just five months later when William Gladstone's Liberal Government fell from power in August 1886. Marshal of the Soviet Union (Russian: Маршал Советского Союза; Russian pronunciation: [ˈmarʂəɫ sɐˈvʲɛtskəvə sɐˈjuzə]) was the highest military rank of the Soviet Union. The rank of Marshal of the Soviet Union was created in 1935 and abolished in 1991, and forty-one people held this rank. The equivalent naval rank was until 1955 Admiral of the fleet and from 1955 Admiral of the fleet of the Soviet Union. Both ranks were comparable to NATO rank codes OF-10, and to the five-star rank in anglophone armed forces. While the supreme rank of Generalissimus of the Soviet Union, which would have been senior to Marshal of the Soviet Union, was proposed for Joseph Stalin after the Second World War, it was never officially approved. The rank insignia of the French Navy (French: Marine Nationale) are worn on shoulder straps of shirts and white jackets, and on sleeves for navy jackets and mantels. Until 2005, only commissioned officers had an anchor on their insignia, but enlisted personnel are now receiving them as well. Although the names of the ranks for superior officers contain the word "Capitaine" (Capitaine de corvette, Capitaine de frégate and Capitaine de vaisseau), the appropriate style to address them is "Commandant", "Capitaine" referring to "lieutenant de vaisseau", which is translated as lieutenant. The two highest ranks, Vice-amiral d'escadre and Amiral (Admiral), are functions, rather than ranks. They are assumed by officers ranking Vice-Amiral (Vice-Admiral). The rank of Vice-Admiral of France (French: Vice-Amiral) was formerly designated as Lieutenant-General of the Naval Armies until 1791, such as in the Levant Fleet and Flotte du Ponant of the Ancien Régime. Major of the French Navy has a similar history to that of the former Lieutenant-General of the Naval Armies. The only Amiral de la Flotte (Admiral of the Fleet) was François Darlan after he was refused the dignity of Admiral of France. Equivalent to the dignity of Marshal of France, the rank of Admiral of France remains theoretical in the Fifth Republic; it was last granted in 1869, during the Second Empire, but retained during the Third Republic until the death of its bearer in 1873. The title of Amiral de la Flotte was created so that Darlan would not have an inferior rank to that of his counterpart in the British Royal Navy, who was an Admiral of the Fleet. Admiral of the Fleet Roger John Brownlow Keyes, 1st Baron Keyes, (4 October 1872 – 26 December 1945) was a Royal Navy officer. As a junior officer he served in a corvette operating from Zanzibar on slavery suppression missions. Early in the Boxer Rebellion, he led a mission to capture a flotilla of four Chinese destroyers moored to a wharf on the Peiho River. He was one of the first men to climb over the Peking walls, to break through to the besieged diplomatic legations and to free the legations. Admiral Flota Sovetskogo Soyuza Kuznetsov (Russian: Адмира́л фло́та Сове́тского Сою́за Кузнецо́в "Admiral of the Fleet of the Soviet Union Kuznetsov") is an aircraft carrier (heavy aircraft cruiser in Russian classification) serving as the flagship of the Russian Navy. It was built by the Black Sea Shipyard, the sole manufacturer of Soviet aircraft carriers, in Nikolayev within the Ukrainian Soviet Socialist Republic (SSR). The initial name of the ship was Riga; it was launched as Leonid Brezhnev, embarked on sea trials as Tbilisi, and finally named Admiral Flota Sovetskogo Soyuza Kuznetsov after Admiral of the fleet of the Soviet Union Nikolay Gerasimovich Kuznetsov.It was originally commissioned in the Soviet Navy, and was intended to be the lead ship of the two-ship Kuznetsov class. However, its sister ship Varyag was still incomplete when the Soviet Union collapsed in 1991. The second hull was eventually sold by Ukraine to the People's Republic of China, completed in Dalian and commissioned as Liaoning. Admiral Gorshkov was an aircraft carrier (heavy aircraft cruiser in Russian classification) of the Soviet Navy and the Russian Navy from 1987 to 1996. The ship's original name was Baku when it was commisioned in 1987. Sometimes Admiral Gorshkov is considered a separate class due to its improvements including a phased array radar, extensive electronic warfare installations, and an enlarged command and control suite. She was launched in 1982, and was in service from 1987 to 1991 in the Soviet Navy as Baku, and from 1991 to 1996 in the Russian Navy as Admiral Gorshkov. In 2004, she was sold to India and converted into a STOBAR carrier now named INS Vikramaditya.